For those preferring to use a headset microphone but desiring the advanced features of the circuitry in the TableMikes and TravelMike, this is the simple way to supercharge your current mic by adding the Auto Gain Control and Equalizer technology to your current product. In effect, this is an external sound adapter (like those made by Andrea, VXI and Buddy) but on STEROIDS! Comments: The net effect of this product is to significantly improve the performance of your current headset microphone. We have tested it extensively with the Sennheiser ME3 and Audio Technica 8HEmW and have a hard time believing what a difference this makes in terms of external noise rejection and accuracy in our two best headsets. How does this compare to other external USB adapters we sell? Honestly, it leaves them in the dust. It's that much of an advancement. Without a doubt, though, it is expensive. So if you are happy with the results of your current headset and USB adapter, there is no reason to consider this. 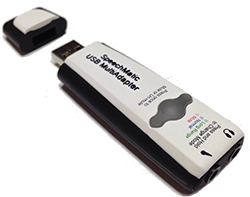 If you have reason to seek even higher levels of accuracy, consider substituting the SpeechMatic MultiAdapter for your current USB adapter. From Norman Cousins of New York, New York on 4/10/2017 .